MIXiii-Biomed 2019 is fast approaching. The high standard scientific program is ready to deliver a wealth of information, new technologies and the latest news relevant to the fields of Biomedicine. 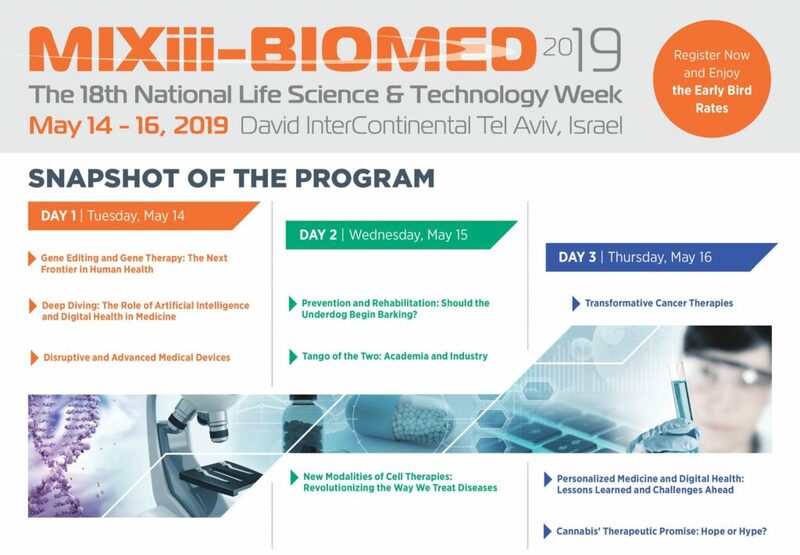 Co-organized by leading Israeli and international healthcare institutions, we invite you to join us in lively discussions, interact with local and international Speakers and stay in the loop of new developments in Life Science & Technology. As a registered participant, you have access to our unique B2B networking platform. Profile yourself and your company and Network with local and international likeminded future investors, partners and like-minded colleagues. Use this opportunity to participate and become a key player in the Biomed Industry. Remember to register before May 1 to take advantage of the lower registration rate. For registration queries please contact: Ms. Ronit Steinmetz.